Gotse (Georghi) Nikolov Delchev was born on January 23, 1872, in the town of Kukush, southeastern Macedonia. He received his elementary education in the local Bulgarian school of Kukush, and later entered the Gymnasium of Salonica. Here Delchev became one of the most popular of the students, not only in point of scholarship, but also as a youthful agitator and advocate of Macedonian independence. Delchev, while in Salonica, familiarized himself with the various revolutionary undercurrents in Europe, particularly that of socialism. Notwithstanding his social concepts, in 1891 he entered the military school in Sofia. Here Delchev found himself in an entirely different environment. His life as a cadet and confinement to the barracks was monotonous. There was not the old variety of life and schoolmates with its variant influx of ideas of social concept. While in Military School he was not in a position to indulge in discussions of, nor to participate in any movement pertaining to the destiny of Macedonia. Notwithstanding the strict discipline, however, Delchev managed to secretly procure and read socialistic literature. In spite of his social philosophy of life, Delchev often expressed himself that the undelivered Bulgarians and the other races in Macedonia should be liberated from the unbearable yoke of Abdul Hamid; and that liberty was always brought with blood-and that such sacrifices must cheerfully be given for its attainment. "I conceive the world," said Delchev, "only as a place for cultural rivalry of the nations." His activity while in the Military school had been severely censored. He was on several occasions called before the superior officer of the school for disciplinary insubordination. His early dismissal from the school was averted only by the intervention of influential individuals of Macedonian origin in the Principality. 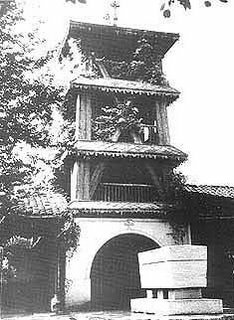 But in 1894 an incident occurred in the school which also resulted in Delchev’s expulsion. At that time the Bulgarian Ministry of War, in order to cut down on the budget, delayed the appointment of of the newly-graduated cadets. Some of the latter became angered with the procrastination. An anonymous letter was sent to the Minister of War, accusing him of the injustice done to the new officers. 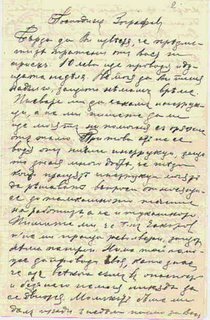 Although dlechev had nothing to do with the writing of the letter, he was, nevertheless, included among the guilty "ones." The administration of the school, upon a strict investigation, revealed the authors of the letter, and in order of dismissal found that "together with the junkers x.y.z. as authors of the letter, Georghi Delchev is also expelled." Goce Delchev-Junker in BULGARIAN military scholl! 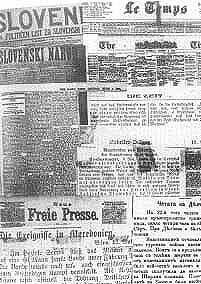 While the Bulgarian intellectuals in the interior of Macedonia , under the leadership of Gruev, Toshev, Matov, Dr.Tatatrchev, and others, were organizing secret revolutionary committees in Salonica, Serres, Shtip, etc., Delchev, on the other hand, independenl and without knowing what was going on in Macedonia in this respect, undertook while in Sofia, to animate the spirit of organization among the immigrants. He visited most of the Macedonian intellectuals there and insisted upon the issuing of a newspaper in order to preserve the esprit de corps of the Bulgarian beyond the border. When he heard of the news that the first secret Central Revolutionary Committee was organized in Salonica, Delchev’s enthusiasm wa greatly animated. He immediately betook himself to the south-into Macedonia! After his expulsion from the Military School in 1894, Delchev returned to Macedonia, and his revolutionary activity in the internal affairs of Macedonia began from the above date. It continued for nine years. During all these years Delchev roamed about, either alone or in a company of trusted comrades, throughout Macedonia. He devoted his life to that legendary apostolic work which made him the most beloved among the masses of the country. Upon his arrival in Shtip, Delchev met Dame Gruev, the founder of the local revolutionary committee. They met there for the first time and became intimate friends and co-workers. Delchev and Gruev undertook to bear the whole work of the conspiracy upon their shoulders. In order to animate the spirit of revolt and to organize and prepare the masses for this objective, they both decided to teach in Macedonia. Through request and pressure on the Exarchy, they were appointed teachers-Gruev, in the city of Shtip itself, and Delchev, in the village of Novo-Selo, in the vicinity of Shtip. These two apostles now became the supreme masters of the conspiracy of the IMRO. Delchev, either as teacher or a disguised peddler, as a merchant or an unsuspected villager, was spreading the gospel of liberty. He was the first to propagate the idea of autonomy for Macedonia. In order to have a wide-spread acceptance of this principle-the autonomy of Macedonia-he undertook, with the cooperation of others, to organize peasants as well as the city dwellers of the districts of Shtip, Serres, Salonica, Monastir (Bitola), Ochrid, Lerin, Kostur, etc. there was not a corner in the eastern, northeastern, southern, and southwestern part of Macedonia which Delchev failed to visit. He became a true apostle-he followed the example of Levsky! The organization of Delchev was so systematic, so cautious and effective, that in a period of a few years he was able t create a new invisible "state" within the decaying Turkish Empire in Europe. Delchev became the new Levsky. He was everywhere and no wher. His whereabouts in Macedonia were beyond the ability of the Turks to detect. Delchev was acclaimed by the populace of the country as their liberator. There has been no greater man in the whole internal revolutionary movement than "Gotse." His gospel and achievement deeply penetrated the masses of the Macedonian peasants. The authorities certainly felt the effects of his work. His numerous secret revolutionary committees became the terror of the Turks. The latter, thoroughly convinced that Delchev was a great factor in the IMRO movement, offered large prizes for his capture-either alive or dead. Indisputably and beyond any doubt, Delchev was the greatest motivating spirit of the IMRO from the time of its organization until his death in 1903. There was hardly another person in the movement who exerted such an influence over the masses-more particularly over the peasants. In his revolutionary activity Delchev was guided by one thought: the Macedonian people must be organized and well armed, so that when the deciding moment arrived they might rise in revolt as one man against the tyranny of Abdul Hamid. 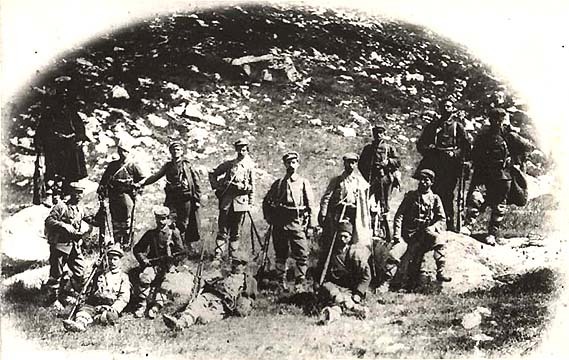 "The liberation of Macedonia," wrote Delchev, "is possible only by an internal insurrection. Whoever thinks otherwise for the freedom of Macedonia, he fools himself and fools the others." Throughout his revolutionary career Delchev was guided solely by the interests of the Macedonian people as a whole regardless of race or creed. In spite of the fact that in the Bulgarian schools of Salonica and Sofia he had been educated in the spirit of nationalism, Delchev looked upon all races in Macedonia as his brothers and fellow-countrymen. He was struggling for the freedom not only of the Macedonian Bulgars, but also of all nationalities inhabiting Macedonia (Bulgarians, Turks, Greeks, Roumanians, Albaninas, Gypsies, Jews etc.). He accepted and preached the principle pronounced by Gladstone "Macedonia for the Macedonians." 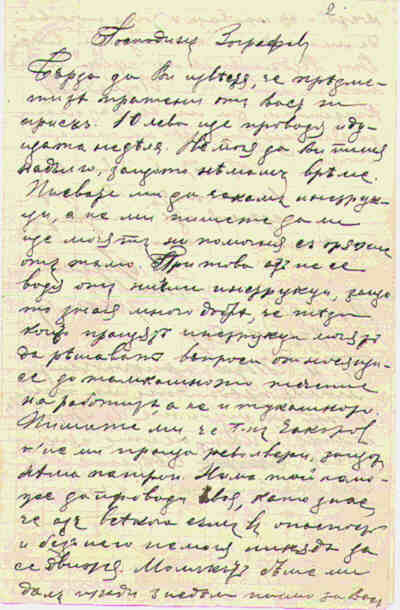 Delchev was against the annexation of Macedonia to Bulgaria. When in the early period of the formation of the revolutionary movement, a current developed with purely nationalistic tendencies, Delchev was the first to oppose them. Energetically, with words and deeds, he opposed any movement which did not profess the unity and independence of Macedonia. "The purpose of the orgaization is,"said Delchev,"not to make Bulgarians or Greeks, but to work for freedom from the Turks and then let anybody become whatever he pleases." Delchev was a revolutionist Pro-Macedonian par excellence. He was not a hater of nationalities but despised those who oppress peoples-the tyrants-regardless of their nationality. Unfortunately Delchev’s death was a tragic one-quite usual in the annals of the Macedonian martyrology. 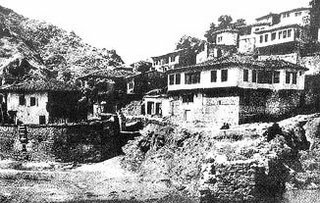 While roaming through the southern part of Macedonia, preparatory to the anticipated general insurrection which was to take place on August 2, 1903, he arrived, April 10, in the village of Banitza, in the district of Serres. Simultaneously two other chetas (bands) arrived, one under the leadership of the voyvoda Georghi Brodiliata and the other under the voyvoda Dimitar Gushtanov. Altogether there were twenty men. They settled in two houses for the evening. The next day, before daybreak, the village was surrounded by Turkish soldiers, more than a thousand of them. While they were searching for arms, the Turks approached the two houses where Delchev and his comrades were lodged. Escape was impossible-the battle was on! The ferocious struggle went on while the village blazed. Delchev and his men burst out toward evening, attempting by means of volleys and bayonets to break the Turkish line. They were outnumbered 50 to 1! Not one of the besieged comitajis was captured alive. They kept up the fight to the last man! More than one hundred men of the enemy were slain. So were Delchev and his comrades-in-arms-to the last man! This tragic episode occurred on April 21, 1903, a little over three months before the general insurrection was officially declared. Such was the end of Delchev’s romantic career-the most venerated Macedonian revolutionist.